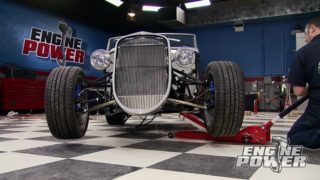 (ANNOUNCER)>> WHAT STARTED WITH A RATTLE CAN ENDS TODAY WITH A BEEFED UP SMALL BLOCK FORD IN AN ULTRA MODERN HOT ROD PACKAGE ONE LUCKY VIEWER WILL WIN! DUMMY BLOCK TO MAKE SURE WE HAD PLENTY OF ROOM. 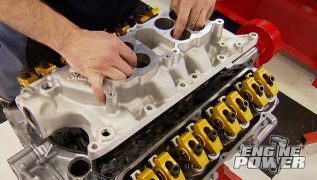 (PAT)>> AND TODAY THAT'S GETTING REPLACED WITH THIS REENGINEERED ROLLER 302 LONG BLOCK WE ORDERED FROM POWERTRAIN PRODUCTS. 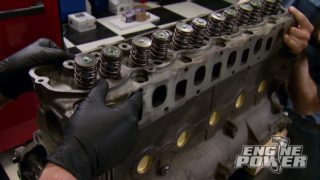 NOW THIS IS A FIVE LITER MUSTANG ENGINE THAT'S BEEN COMPLETELY GONE THROUGH, AND IT'S FACTORY RATED AT 225 HORSEPOWER, WHICH IS FINE TO LEAVE ALONE BUT BETTER YET IT'S A GREAT STARTING POINT TO MAKE A LITTLE MORE POWER. WE'RE GONNA BE ADDING OUR OWN LITTLE TWIST TO THIS BY PUTTING IN A SLIGHTLY MORE AGGRESSIVE CAM SHAFT AND CONVERTING THE HEADS TO STUD MOUNT ROCKERS ALL COURTESY OF CRANE CAMS. INDUCTION WILL BE FROM THIS DUAL FOUR BARREL INTAKE FROM EDELBROCK ALONG WITH TWO 500 CFM CARBURETORS. LIGHTING IT ALL OFF WITH BE PERTRONIX IGNITION WITH ETHREE SPARK PLUGS, AND ALL THE BELLS AND WHISTLES TO FINISH THIS THING OFF ARE COURTESY OF SUMMIT RACING. AND WILL GET REUSED. THIS GETS US ONE STEP CLOSER TO REMOVING THE CAM. NOW TWO FASTENERS ARE REMOVED TO FREE UP THE CAM SHAFT RETAINING PLATE. AND THE CAM CAN GET REMOVED. JUST LIKE WHEN YOU INSTALL A CAM, BE CAREFUL REMOVING ONE. NICKING THE CAM BEARINGS WITH THE LOBES OR THE JOURNAL WILL TIGHTEN UP THE NEW CAM IN THE BORE AND LEAD TO A CAM BEARING FAILURE. OUR NEW STICK IS A CRANE CAMS POWER MAX HYDRAULIC ROLLER. NOW IT FITS '85 AND UP FORD AND MERCURY SMALL BLOCK VEIGHTS BECAUSE THEY WERE ROLLER ENGINES FROM THE FACTORY. THE INTAKE HAS 214 DEGREES OF DURATION AND THE EXHAUST IS 220. LIFT AT THE VALVE IS 482 ON THE INTAKE AND 497 AT THE EXHAUST USING A ONESIX ROCKER ARM. THE LOBE SEPARATION ANGLE IS 112 DEGREES, WHICH WILL GIVE THIS LITTLE 302 A NICE SMOOTH IDLE. THE BLOCK AS WELL. 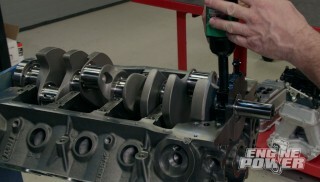 NOW THE TIMING SET IS ALIGNED WITH THE CRANKSHAFT KEY WAY AND THE CAM SHAFT IS PRESSED ON BY HAND. LIKE EVERY OTHER ENGINE THAT'S ASSEMBLED HERE, WE'LL CHECK THE CAM'S POSITION BY DEGREEING IT TO INSURE WHAT'S ON THE CAM CARD IS ACCURATE, AND IT IS. NORMALLY ON ENGINES DESIGNED FOR FUEL INJECTION YOU DON'T SEE THIS. IT'S AN ECCENTRIC TO RUN A MECHANICAL FUEL PUMP. IT'S OFFSET TO ACT AS A LOBE. WE'LL SHOW YOU THE REST IN JUST A FEW. TEXTURED METALLIC. IT HAS SUPERIOR METAL AND PLASTIC ADHESION, IS FAST DRYING, AND EASY TO APPLY. NOW A THIN FIRST COAT FOLLOWED UP BY A HEAVIER SECOND COAT GIVES EXCELLENT COVERAGE. TO PROTECT THAT FINISH VHT'S SATIN CLEAR WILL LAY ON TOP OF IT. IT'S CHIP RESISTANT AND RATED TO HANDLE TEMPS UP TO 2,000 DEGREES. (PAT)>> BACK IN THE SHOP WE'RE USING SOME TINS WE HAD IN OUR PARTS ROOM TO COVER THE ENGINE'S INTERNALS SO WE CAN PAINT THE BLOCK AND HEADS. FIRST WITH ENGINE ENAMEL PRIMER WITH CERAMIC. IT'S OIL AND GAS RESISTANT, MAKING IT IDEAL FOR THIS TYPE OF APPLICATION. IT WITHSTANDS TEMPS UP TO 500 DEGREES, WELL BEYOND AN ENGINE'S FAILURE POINT. IT'S GETTING DUPLICOLOR'S ENGINE ENAMEL WITH CERAMIC. KEEPING WITH THE SILVER LOOK OF THE TINS, THIS IS CAST COAT ALUMINUM. AFTER IT'S DRY WE'LL REMOVE THE VALVE COVERS AND TAPE TO CONTINUE THE BUILD. BY DROPPING THE ROLLER LIFTERS BACK IN THEIR BORES, FOLLOWED BY THE LIFTER GUIDES. NOW THE SPRUNG RETAINER IS BOLTED BACK DOWN TO SECURE IT ALL, WHICH ALLOWS US TO ROLL THE ENGINE OVER TO FINISH UP THE BOTTOM END. 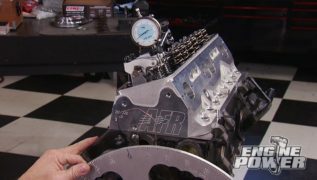 (MIKE)>> THAT INCLUDES THIS FORD RACING STANDARD VOLUME OIL PUMP THAT'S HELD IN PLACE WITH ARP FASTENERS. THE PICK UP ATTACHES TO THE PUMP, AND IT'S DESIGNED TO WORK WITH FRONT SUMP PANS, LIKE THIS CAL CUSTOMS FINNED ALUMINUM FIVE QUART PAN. NOW FASTENERS FROM OUR ARP ACCESSORY KIT WILL SNUG IT DOWN. (ANNOUNCER)>> NEXT, THE CHASSIS MEETS ITS MATE. (MIKE)>> BACK AGAIN SO SOON. 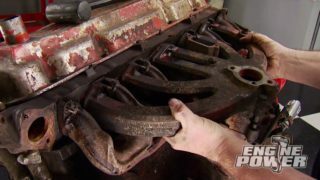 (MARK)>> ENGINE'S LOOKING GREAT, CAN YOU TELL ME A LITTLE BIT MORE ABOUT WHAT YOU DID. (PAT)>> MARK FROM DUPLICOLOR IS BACK WITH US FOR PART TWO TO ADD SOME MORE OF HIS RATTLE CAN TOUCH. (MARK)>> TODAY WE'RE GONNA BE WORKING ON VALVE COVERS, AND WE'RE GONNA BE USING OUR VHT WRINKLE PLUS IN A BLUE. IT'S A REALLY BRIGHT COLOR SO IT REALLY WILL ACCENT THE ENGINE. THE WRINKLE FINISH IS KINDA A TIE BACK TO THE OLDER DAYS. IT'S KIND OF AN OEM LOOK THAT WAS THERE IN THE PAST. SO IT'S JUST A REALLY DURABLE, NICE TEXTURED COATING THAT IS ALSO HEAT RESISTANT UP TO 350 DEGREES. IT TAKES A LITTLE BIT LONGER TO DRY. SO TO HELP EXPEDITE THAT PROCESS AND GET IT BACK TO MIKE AND PAT WE'RE GONNA USE A HEAT GUN TO ACCELERATE IT. WITHOUT THE HEAT GUN YOU CAN LET IT DRY IN THE SUN BUT IT MAY TAKE A COUPLE OF HOURS. RIGHT HERE YOU CAN PROBABLY SEE A GOOD BIT OF THE WRINKLE HAPPENING RIGHT NOW BUT THAT LOOKS VERY GOOD. KIT TO 25 FOOT POUNDS. WE DO NEED A LONGER PUSH ROD FOR THIS SETUP. LUCKY FOR US THESE COMP CAMS SIX-600 LONG WERE SITTING IN OUR PARTS ROOM. ALUMINUM FOR STRENGTH AND LONGEVITY. LASH IS HALF TURN PAST ZERO. ALONG WITH LOCTITE SILICONE ON THE CHINA RAILS, WE'LL SEAL THE VALLEY WITH THIS EDELBROCK F-28 DUAL PLANE, DUAL QUAD INTAKE MANIFOLD. 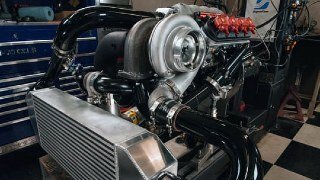 IT HAS AN OPERATING RANGE FROM 1,500 TO 6,500 RPM, AND IT'S DESIGNED TO WORK WITH EDELBROCK OR CARTER CARBS. 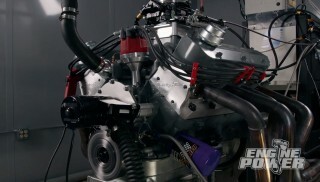 (MIKE)>> THE SUMMIT RACING PRO STREET BALANCER IS THE LAST PART TO GO ON THE ENGINE BEFORE WE PULL IT OFF THE STAND. URETHANE ENGINE MOUNTS. OUR ENGINE SLING IS FROM PIT PAL AND IS RATED TO 1,000 POUNDS. WE'LL ATTACH IT TO THE FRONT AND REAR EXHAUST PORTS TO KEEP THE ENGINE SOMEWHAT LEVEL. OUT BACK WE CAN BOLT UP THE FLEX PLATE BECAUSE THIS HOT ROD IS GETTING AN AOD. JIM AND TONY FROM FACTORY FIVE ARE BACK. GOOD TO SEE YOU AGAIN. AND JUST IN TIME TO HELP WITH THE TRANSMISSION. IT CAME FROM POWERTRAIN PRODUCTS JUST LIKE OUR LONG BLOCK. 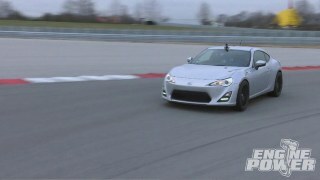 IT'S BEEN FULLY REMANED AND DYNO TESTED TO SIMULATE DRIVING CONDITIONS AND LOAD IN EVERY GEAR. MAKING THE CONNECTION BETWEEN THE TWO IS A B&M CONVERTER WITH A 3,000 RPM STALL. THAT MAY SEEM HIGH BUT DON'T QUESTION IT. 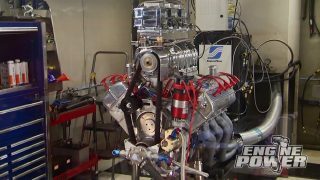 THE FACTORY FIVE GUYS HAVE DONE THEIR HOMEWORK AND KNOW WHAT WORKS WITH THEIR LIGHTWEIGHT HOT ROD. 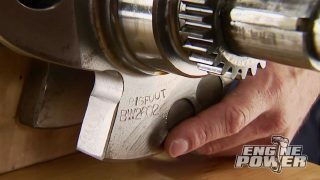 ONCE MATED, ARP FASTENERS GO THROUGH THE BELL HOUSING TO SECURE IT TO THE BLOCK. AND UNDERNEATH WE CAN ALIGN THE CONVERTER WITH THE FLEX PLATE AND TIGHTEN THE NUTS. INSTALLING THE SPEEDOMETER SENDING UNIT SHOULD HAPPEN NOW, OTHERWISE IT CAN BE A TIGHT FIT ONCE THE TRANS IS IN. WE CAN ALSO TIGHTEN THE TRANS MOUNT AT THIS TIME. RADIATOR AS AN ASSEMBLY TO HAVE A CLEAR PATH TO ITS NEW RESTING PLACE. HERE WE GO, THE TIME TO UNITE THIS DRIVETRAIN WITH A MODERNIZED HOT ROD IS HERE. HAVING SEVERAL HANDS IS A GOOD IDEA. WE DON'T WANT TO SCRATCH THE CHASSIS OR FIREWALL. IT WILL JUST ADD MORE WORK IF YOU HAVE TO DO REPAIRS. SO DON'T RUSH AND THE END RESULT WILL BE GRATIFYING. (MIKE)>> WITH THE MOUNT STUDS ALIGNED, WE CAN LOWER THE ENGINE UNTIL IT RESTS ON THE CHASSIS PADS, AND START THE NUTS. MID WAY BACK THE URETHANE TRANS MOUNT CAN BE SECURED, AND THE FINAL LINK FOR THE DRIVETRAIN IS THIS DRIVESHAFT THAT'S SUPPLIED FROM FACTORY FIVE. IT'LL SLIDE INTO THE TAIL HOUSING FIRST, THEN BOLT TO THE PINION FLANGE OUT BACK. (PAT)>> WE'RE STILL THRASHING TO GET THIS '33 HOT ROD FIRED UP BEFORE WE HEAD HOME TODAY. IT'S A BUILD THAT'S BRINGING US ALL A LOT OF EXCITEMENT. DUPLICOLOR IS PLAYING A BIG PART TOO. 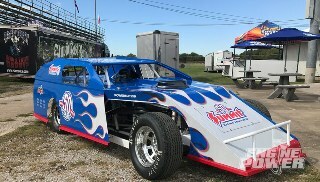 RATTLE CAN ROD SPORTS ALL THEIR PAINT, INCLUDING THEIR VHT FLAME PROOF LINE ON OUR JBA HEADERS. HEAT RESISTANT AND EXTREMELY DURABLE. IT'S RATED FOR 1,300 TO 2,000 DEGREES INTERMITTENT HEAT. AND THAT'S REALLY GREAT FOR THE HEADER SINCE THEY GET HOTTER, BUT THIS IS A VERY HIGH TEMPERATURE COATING AND TRUE TO THAT VHT NAME. 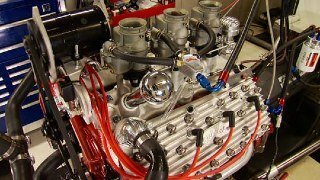 (MIKE)>> AUTOZONE SUPPLIED THE COMPONENTS WE NEED TO POWER THE CAR, START THE ENGINE, AND SUPPLY FUEL TO THE CARBURETORS. NOW THE REASON WE WENT THIS ROUTE IS SIMPLE LOGIC. THE FUEL PUMP ARM. THIS IS WHERE IT RIDES ON THE CAM ECCENTRIC. NOW IT CAN BOLT TO THE BLOCK. 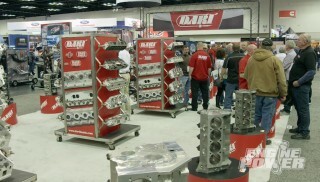 THIS IS A DURALAST GOLD SERIES STARTER THAT'S BUILT WITH 100 PERCENT NEW PARTS, NOT REMANUFACTURED. TORQUE OUTPUT MEETS OR EXCEEDS FACTORY EQUIPMENT AND THE SOLENOID IS BUILT ONTO THE UNIT. GASKETS, THE 500 CFM CARB WITH ELECTRIC CHOKE, AND THE SECONDARY CARB WHICH IS ALSO 500 CFM. AND TO MAKE THE LINK FROM YOUR FOOT TO THE THROTTLE BLADES TONY IS INSTALLING THE THROTTLE CABLE. 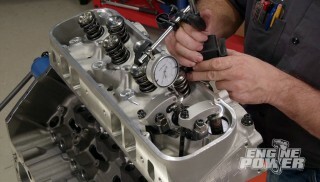 (PAT)>> LINKING THE CARB'S FUEL INLETS IS AN EDELBROCK DUAL QUAD FUEL LINE KIT. OUR BELT SHOWED UP, SO IT'S BEING INSTALLED AND THE TENSION IS BEING SET. TO KEEP RATTLE CAN ROD OLD SCHOOL COOL WE DECIDED TO ADD A BIT OF NOSTALGIA BY PUTTING ON A DUAL FOUR BARREL SETUP FROM SUMMIT RACING AND EDELBROCK. WITH ACCESS THIS EASY IT CAN'T GET ANY BETTER TO HOOK UP. ETHREE DIAMOND FIRE SPARK PLUGS. (ANNOUNCER)>> COMING UP THE BOYS SHOOT ON A LITTLE ACCENT. THEN BUTTON UP THE BUCKET FOR A LITTLE PAVEMENT POUNDING. (PAT)>> WE ARE BACK AND IN THE HOME STRETCH OF OUR RATTLE CAN ROD PROJECT, ABOUT TO GIVE IT ANOTHER SPLASH OF COLOR. (TONY)>> WE GOT THE CAR MASKED OFF. AND WHAT WE'RE GONNA DO IS PUT A NICE BLUE STRIPE WITH DUPLICOLOR SINGLE STAGE PAINT ON THE SIDE OF THE CAR JUST TO GIVE THAT CAR A LITTLE BIT MORE PIZAZZ TO IT, CAUSE IT'S JUST A BLACK, FLAT BLACK CAR. I'M USING DUPLICOLOR'S PAINT SHOP FINISH SYSTEM, MIDNIGHT BLUE. AND THE NICE THING IS IT'S READY TO GO RIGHT OUT OF THE CAN. NO MIXING, NO REDUCING, READY TO SPRAY. I'LL DO THREE LIGHT COATS TO GIVE THIS THING A NICE SUITABLE ACCENT. (PAT)>> THIS IS A BRAND NEW CAR RIGHT THERE, THAT'S AWESOME! AND A FEW SMALL THINGS. NOW THAT WE HAVE ACCESS, TWO DASH SIX LINES WILL MAKE THE LOOP FROM THE RADIATOR TO THE TRANSMISSION SO IT STAYS COOL AS WELL. THE LOWER RADIATOR HOSE IS RAN AND THE FINAL CONNECTIONS FOR THE COOLING SYSTEM ARE DONE. ALLOWS THEM TO CLEAR THE ROLLER ROCKER ARMS, FOLLOWED BY THESE SPORTY LITTLE BREATHERS. 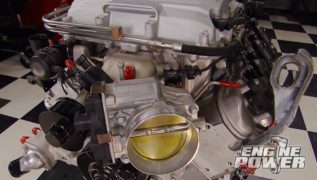 (MIKE)>> WE'RE GOING RACING TECHNOLOGY WHEN IT COMES TO COOLANT FOR OUR '33. NOW THIS IS EVANS HIGH PERFORMANCE WATERLESS ENGINE COOLANT. NOW EVERY OTHER COOLANT ON THE MARKET TODAY HAS SOME PERCENTAGE OF WATER IN IT, AND WE ALL KNOW WATER CAN LEAD TO CORROSION, ELECTROLYSIS, AND OVERHEATING. EVANS PREVENTS ALL OF THE ABOVE BECAUSE THERE IS ABSOLUTELY NO WATER IN IT. NOW IT'S DESIGNED FOR ALL GAS AND LIGHT DUTY DIESEL ENGINES, AND HAS A BOILING POINT OF 375 DEGREES, WITH ANTIFREEZE PROPERTIES BELOW MINUS 40. (PAT)>> AND BEST OF ALL IT PROTECTS FOR THE LIFE OF THE ENGINE, WHICH MEANS YOU BUY COOLANT ONCE AND NEVER HAVE TO CHANGE IT AGAIN. NOW THAT'S COOL. 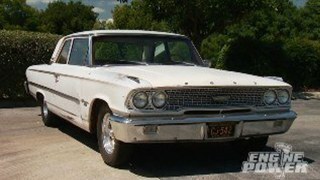 DRIVING, EASY CRUISING, I CAN'T WAIT TO HEAR IT RUN. AND IF I COULD RIG THIS TO BE MINE I WOULD BECAUSE I REALLY LIKE IT. IT'S A NEAT CAR, AND IT'S VERY INSPIRING. 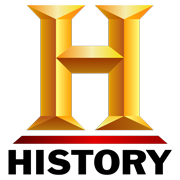 I WOULD LIKE TO MAYBE BUILD ONE OF THESE OF MY OWN ONE DAY. (MIKE)>> WE'RE FILLING THE ENGINE WITH AUTOZONE'S 10 W30 SYNTHETIC BLEND MOTOR OIL. THIS SETUP TAKES SIX QUARTS. AND WE'LL LIGHT HER OFF WITH 87 OCTANE GAS. IT'S BEEN A LONG WEEK. WITH EVERYTHING FINISHED UP, THE TURN OF THE KEY WILL LET US KNOW HOW WE DID. (MIKE)>> WHAT KIND OF OIL PRESSURE? (TONY)>> 55, 60 NOT BAD. (PAT)>> I LOVE THESE GUYS WHEN THEY RUN. (MIKE)>> THIS IS WHAT IT'S ALL ABOUT MAN. HITTING THAT KEY AND HAVING THIS. (PAT)>> I WANT TO THANK YOU GUYS. (MIKE)>> IT'S AWESOME, GOOD BUILD! (PAT)>> WELL THERE YOU HAVE IT. YOU HAVE A CAR THAT HAS A SUPER RESPONSIVE ENGINE, IT HANDLES LIKE A GO KART, AND IT'LL STOP ON A DIME AND GIVE YOU EIGHT CENTS CHANGE. (MIKE)>> AND THOSE ARE THE PERFECT INGREDIENTS FOR A SWEEPSTAKES CAR. SOMEBODY'S GONNA BE A LUCKY WINNER.